No need to go clicking through lots of web pages all the data is on one spreadsheet and can be viewed with ease and efficiently. Just a snippet of what the ratings spreadsheet entails. Horse Racing Ratings, Stats & betting system spreadsheet contains detailed statistics. 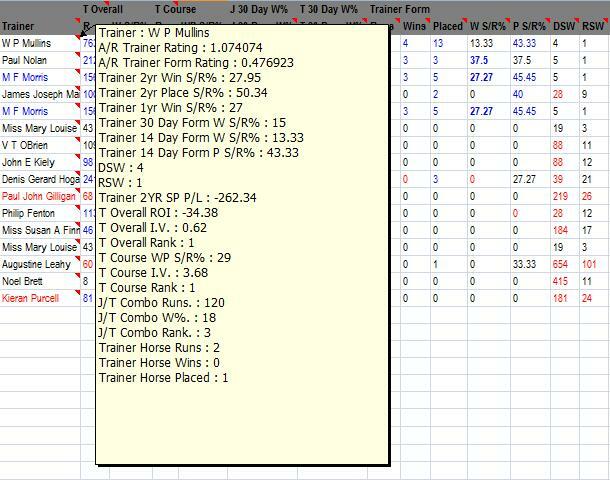 Our comprehensive race card spreadsheet contains all the significant horse racing trainer statistics that any professional or novice gambler requires. Trainer performance is essential in evaluating your bets! 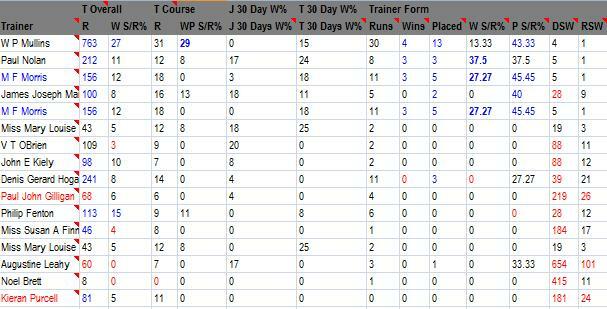 Trainers overall runs, win & place strike rates for 2yr, 1yr, 30 days, 14 days. 2 unique trainer ratings, the first shows how good the trainer is compared to others in the race & the second is very informative in that is shows how well the trainer is doing with winners opposed to other times of the year which is significant in finding trainer patterns and backing winners. Trainers days since last win & runs since last win. Trainers win & place course record, significant in knowing if the trainer performs well at the respected course. Trainers course impact value rating which suggests how well the trainer does compared to the other trainers in the respected race, along with a course rank. The trainers P&L stats plus their return on investment (ROI) figures. Statistics on how many times the horse has ran, won & placed for its respected trainer. Ranking columns so you can quickly see which are the better and worse trainers in the race at the course, with their jockey and overall. Blue & red trainer highlights which quickly help you to identify the trainers who are in hot form and those that are simply struggling to train a winner! Comment pops ups so you can quickly and easily assess the trainers statistical data.